In one hand he had his cell phone, with mom on the line for shopping advice. In the other hand was a handout with a Westville rabbi’s admonition against crossing a picket line to buy food for the Feast of Freedom. His basket was empty. There David stood amid walls of macaroons, white fish, and grape juice in Aisle 13 of the Amity Stop & Shop, pondering the fifth question added to this year’s traditional Passover four questions: To buy? Or not to buy? The Stop & Shop at 112 Amity Road, which was open Friday but picketed by striking workers, offers a large selection of foods that are kosher for Passover because of the Jewish population in and near the Westville section, which isn’t as large as it once was but still is sizable. “I’m lucky in that I happen to have done a lot of my Passover shopping. To buy the rest I won’t cross the picket line,” said Rachel Bashevkin of Westville, who is on the board of Congregation Beth El-Keser Israel. Christina Crowder spends a lot of time conserving and preserving — music, and the environment. An accomplished accordion player, Crowder preserves klezmer music, as a researcher, and as a performer. This Saturday night (March 2) her ensemble Bivolitz will perform the traditional Jewish Ashkenazic music at a concert at with special guest Julie Asuma Levene at Westville’s Congregation Beth El Keser Israel (BEKI) beginning at 7 p.m. Following are excerpts from a eulogy delivered Thursday by Rabbi Jon-Jay Tilsen at the funeral of Adele Tyson, who grew up in the Hill and for decades was a lay leader at Congregation Beth El Keser Israel (BEKI), including serving as president. The lyrics to songs in Yiddish and Ladino had been prepared. Powdered donuts waited on a nearby table. A gaggle of students faced the street, ready to loose a blessing from their lips. Musicians lifted their horns and woodwinds to their mouths, cheeks swelling with breath. Aminah, a Syrian refugee chef who in two years has learned more than passable English and started her own catering business, will be joining the local Jewish community today to celebrate Hanukkah by demonstrating how to bake sufganiyot, Jewish jelly doughnuts. “Through BEKI Eyes: Photographs of Synagogues by our Members” is an exhibition of a selection of synagogue photographs from around the world by members of Congregation Beth El-Keser Israel in New Haven that is on view at the New Haven synagogue through October. Last year, after the speeches had been delivered at the retirement luncheon for custodian Clarence Bromell, and dessert was about to be served, a BEKI member named Sandy Goldberg walked up to the microphone and said he too had something to say. “Oh, we can do this,” Darryl Rotman Kuperstock explained to a local reporter as volunteers served Christmas dinner to 150 people on the New Haven Green. In truth, the volunteers from area synagogues could do this only because of Darryl’s organizational skills. Darryl Rotman Kuperstock’s spreadsheets & volunteer efforts are legendary at BEKI. Ten men slept safe and sound last week at Beth El Keser Israel (BEKI) as part of Abraham’s Tent, a program in which faith communities around New Haven take in men experiencing homelessness during the winter months. With its aging membership too small to stay open, Congregation Sinai of West Haven and Milford has closed after nearly 90 years, merging with Beth El-Keser Israel (BEKI) of New Haven. Clarence Bromell Retires: On December 17, 2017, BEKI volunteers prepared a luncheon in honor of Clarence Bromell, who retired after nearly thirty years of service to the congregation. Photos courtesy of Allen Samuel. When the ark needs to be opened and a Torah carried, who you gonna call? On Shabbat morning at Beth El – Keser Israel [BEKI], a group of teenagers decides. For the last 15 years, teen shamashim have selected people for all of the honors and have kept the service moving along. Congregation BEKI Kadima and United Synagogue Youth (USY) are youth groups that empower Jewish students in middle school and high school to plan and participate in educational, religious, community service, and social events. These activities provide opportunities to build future Jewish community leaders. 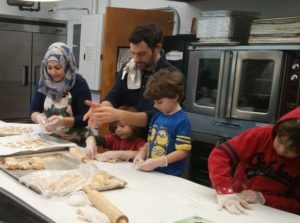 When it was time to make the doughnuts Sunday at Congregation Beth El—Keser Israel, a Muslim refugee from Syria took the kitchen lead. Aminah Mohammad Alsaleh, who arrived here from a refugee camp in Jordan a year ago with her husband and three young children, is trying to learn English, get a driver’s license and start a catering business. All as One: BEKI Program Reaches Out to Adults with Special Needs, by Dorine Leogrande, Connecticut Jewish Ledger, 13 March 1998, p. 3.